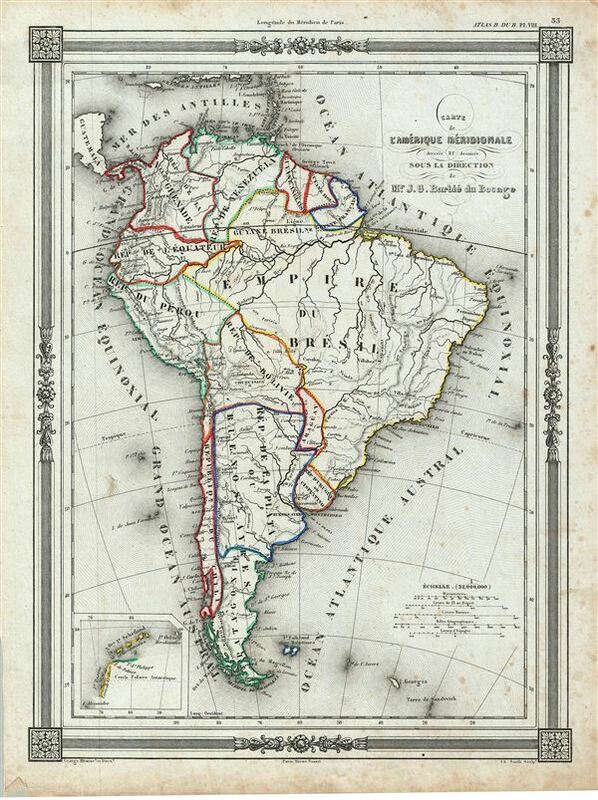 An uncommon and extremely attractive 1852 map of South America. Covers the entire continent from the Caribbean Sea to Tierra del Fuego. It shows the Republic of New Granada, ecuador, Venezuela, British, Dutch and French Guyana, Brazil, Peru, Bolivia, Chile, Patagonia, Republic of La Plata (Argentina) and Buenos Aires and the Falkland Islands. Throughout, the map identifies various cities, towns, rivers and assortment of additional topographical details. Much of South America was, at this time, embroiled in or about to become embroiled in, severe civil strife. The new nations, freed from Spanish dominance though various wars of liberation in the previous decades, were struggling with their newfound independence in an attempt create stable and prosperous governments. Most dissolved into civil war between 1858 and 1864. The map features a beautiful frame style border. Prepared by J. G. Barbie du Bocage for publication as plate no. 33 in Maison Basset's 1852 edition of Atlas Illustre Destine a l'enseignement de la Geographie elementaire.